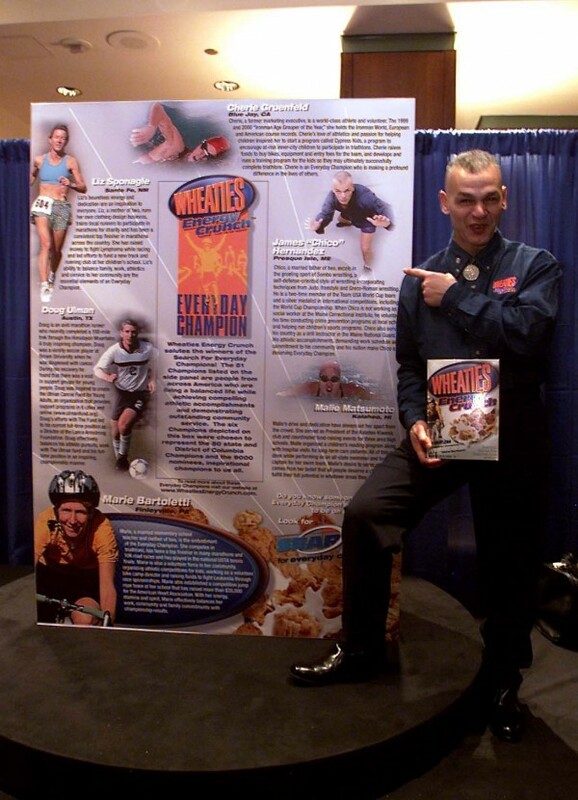 James “Chico” Hernandez of Washburn was a national runner-up to get his picture on a box of Wheaties Energy Crunch cereal in 2001. James “Chico” Hernandez of Washburn is part of this year’s induction class into the AAU Wrestling Hall of Fame. Hernandez, who serves as the varsity wrestling coach at Caribou High School, is one of five inductees and will be honored during a June 29 ceremony in Orlando, Fla. He said he was very surprised when he was notified on the induction. Hernandez has wrestled for Reavis High in Chicago, Chicago State University, the University of Maine at Presque Isle and the U.S. Army National Team. He was named outstanding wrestler as he won the AAU National Sambo Championships in the 163-pound weight class in 1987. In April 2000, Hernandez won the XXV National AAU Sambo Championships held at Disney’s Wide World of Sports Complex. He already has been inducted into the Maine Sports Hall of Fame, the University of Maine at Presque Isle Athletic Hall of Fame and the Illinois Wrestlers Hall of Fame. In addition, Hernandez holds the distinction of being one of only two master’s division wrestlers in the country to have won gold medals in three wrestling disciplines: Greco-Roman, freestyle and Sambo.